تراگنجانش سند B در سند A. در علم رایانه، تراگنجانش (به انگلیسی: Transclusion) گنجایش یک سند یا بخشی از یک سند داخل سند دیگری با اشاره است. برای نمونه، نوشتاری دربارهٔ یک کشور ممکن است نمودار یا پاراگرافی داشته باشد که کشاورزی آن کشور از یک سند متفاوت دربارهٔ کشاورزی خروجی می‌گیرد را شرح می‌دهد. جای نسخه‌گرفتن از داده‌های گنجانیده‌شده و ذخیره آن در دو جای مختلف، یک تراگنجانش، با فراهم‌کردن امکان ذخیرهٔ فقط یک بار داده (و شاید اصلاح‌شده و به‌روزشده اگر نوع پیوند از آن پشتیبانی کند) و مشاهدهٔ در بسترهای متفاوت، طرح پیمانه‌ای در بر می‌گیرد. اشاره یا ارجاع همچنین برای پیوند به دو نوشتار به کار می‌رود. مشارکت‌کنندگان ویکی‌پدیا. «Transclusion». در دانشنامهٔ ویکی‌پدیای انگلیسی، بازبینی‌شده در ۱ فوریه ۲۰۱۵. Di Iorio, A.; Vitali, F. (August 2003). "A Xanalogical Collaborative Editing Environment" (PDF). Proceedings of the Second International Workshop of Web Document Analysis 2003 (WDA2003). Edinburgh, UK. Kolbitsch, J.; Maurer, H. (June 2006). "Transclusions in an HTML-Based Environment". Journal of Computing and Information Technology. ۱۴ (۲): ۱۶۱–۱۷۴. doi:10.2498/cit.2006.02.07. Kolbitsch, J. (June 2005). "Fine-Grained Transclusions of Multimedia Documents in HTML". Journal of Universal Computer Science. ۱۱ (۶). Krottmaier, H. (۲۰۰۲). "Transcluded Documents: Advantages of Reusing Document Fragments" (PDF). Proceedings of the 6th International ICCC/IFIP Conference on Electronic Publishing (ELPUB2002). Czech Republic: Karlovy Vary. pp. ۳۵۹–۳۶۷. Krottmaier, H.; D., Helic (۲۰۰۲). "Issues of Transclusions" (PDF). Proceedings of the World Conference on E-Learning in Corporate, Government, Healthcare, & Higher Education (E-Learn 2002). Montreal, Canada. pp. ۱۷۳۰–۱۷۳۳. Krottmaier, H.; Maurer, H. (July 2001). 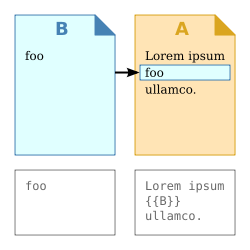 "Transclusions in the 21st Century" (Portable Document Format، HTML، PostScript). Journal of Universal Computer Science. ۷ (۱۲): ۱۱۲۵–۱۱۳۶. Nelson, T. H. (۱۹۸۱). Literary Machines. Mindful Press. Nelson, T. H. (۱۹۹۵). "The Heart of Connection: Hypermedia Unified by Transclusion". Communications of the ACM. ۳۸ (۸): ۳۱–۳۳. doi:10.1145/208344.208353. Nelson, T. H. (۱۹۹۶). "Generalized Links, Micropayment and Transcopyright". Almaden Research Center. Nelson, T. H. (۱۹۹۸). "Transcopyright: Pre-Permission for Virtual Republishing". Nelson, T. H. (۱۹۹۹). "Xanalogical Structure, Needed Now More than Ever: Parallel Documents, Deep Links to Content, Deep Versioning and Deep Re-Use". ACM Computing Surveys. ۳۱ (4es): ۳۳. doi:10.1145/345966.346033. Pam, A. (۱۹۹۷). "Fine-Grained Transclusion in the Hypertext Markup Language" (Text). Internet Draft. Wilde, E.; Lowe, D. (۲۰۰۲). "XML Linking Language" (PDF). XPath, XLink, XPointer, and XML: A Practical Guide to Web Hyperlinking and Transclusion (PDF)|format= requires |url= (help). Addison-Wesley Professional. pp. ۱۶۹–۱۹۸. در ویکی‌انبار پرونده‌هایی دربارهٔ تراگنجانش موجود است. Ted Nelson: Transclusion: Fixing Electronic Literature — on Google Tech Talks, 29 January 2007. این صفحه آخرین‌بار در ‏۸ ژوئیهٔ ۲۰۱۷ ساعت ‏۱۱:۱۸ ویرایش شده‌است.